Independent research by Towards Maturity launched at the CIPD L&D show reveals that when it comes to innovative learning, charities are championing the use of learning technologies, often beating their corporate and public sector counterparts in the benefits they are reaping. Vier bis fünf Jahre gibt man dieser Bewegung zum Durchbruch in Lehre, Lernen und Forschung. Wer sich einen ersten Überblick über diesen weltweiten Trend, den es seit 2007 gibt, verschaffen will, über Nutzer, ihre Motive und Interessen, sowie einige Technologien, Apps und Projekte ist hier richtig. Die Verbindungen zur Lernwelt sind vielfältig: Zum einen, denken wir an das Training in vielen Sportarten, liegen sie auf der Hand. Zum anderen ermöglichen Daten über unsere Bewegungen, unseren Schlaf, unser Wohlbefinden und unsere Routinen gezielte Verhaltensänderungen mit einem positiven Effekt auf unser Lernen und unsere Produktivität. So die Idee. At Up 2 Us this year, MJ Broadbent encouraged us to go outside and really look at our environment. So Dave Gray (shown), Michelle Gray (who took the picture above), Mike Hruska, Patrick Scullin and I grabbed the nouveau Polaroid camera to take up the best real estate at the park - the end of the boardwalk by the Haw River. Notice that the water doesn't look like much - just a sludgy brown surface. When the pictures came out of the camera, it was amazing what came out. Probably a bit tricky to see in the shots above (thanks Megan for taking a picture of the board), but the camera captured a lot more detail than I saw staring in the water with my naked eyes. The branches and small shrimp-like critters. The differences in the currents between the surface and underwater. The pictures also didn't capture the water temperature (cold, but I could stick my feet in it comfortably for about 10 minutes), the conversation (mostly about the nature of joy), the smell (slightly swampy)...all the little details. A reminder to slow down and really be with my surroundings. Observe ALL of the parts - not just what is apparent with the eyes. Not just how I THINK things should flow and work and evolve. Yeah...we "debriefed" afterwards. I stood up in front of people I have mad respect for and improvised something sortakindanotreally related to the "exercise." I think I was muttering something about paying attention to "what lies beneath" when analyzing any system at the time this picture was taken. At least - I tried to sound intelligent. "So Wendy, what do you think "Joy" is?" Dave asked when he realized I wasn't really engaged in the conversation by the river. You know....this may be it. The feeling that all is as it should be and I belong here. That realization alone made the weekend. TotaraLMS 2.6, the latest release of the enterprise distribution of Moodle, will be unveiled at ASTD 2014 in Washington DC next month. Want an Engaging E-Learning Course? Start with a Case Study. A few years back I worked for an organization that suffered through a number of workplace deaths. The company was fully committed to a safe work environment and already had sufficient training. However, they were concerned that people weren’t serious about the safety procedures which was the cause of the deaths. So they put together some case studies where they told the story of how each death happened and how they could have been prevented. In all of the cases, the people disregarded the safety training and one person actually died right after giving a safety briefing and then ignored the precautions he just discussed. To this day, I can recall many of the details and solutions that could have prevented the deaths because the way the cases were presented (and of course the emotional impact). Here’s the point. Instead of building big interactive elearning courses to address the issue they created a series of case studies that were meaningful and real. Sometimes you don’t have time to build a big course. But at the same time you don’t want to get stuck with the typical click-and-read course. In those cases a case study is a great way to move past the information dump and create a meaningful course. A lot of elearning consists of mostly linear click-and-read courses. Those courses are fine for sharing information, but often they’re not very engaging or memorable. In fact, one of the things I’m asked most is how to get past the click-and-read course and make something more engaging. My first rule of thumb is to make sure it’s relevant to the end user. If it’s not relevant, odds are you’ll resort to gimmicks to make it seem engaging. For example, you may want to gamify it or build an interactive branched scenario. Those are all effective considerations when used appropriately. However those types of courses can also be frustrating if they are irrelevant and meaningless to the person taking the course. So if you want to make engaging courses, first make sure that the content is relevant to the end user. But the reality is that those types of courses are more like electronic documents than they are courses. And that’s what we get—well documented (but less than engaging) elearning courses. The good thing is that there’s a happy middle point—a way to transform the linear information dump into something more engaging without the time commitment to build a fully interactive course. If you don’t have time for a fully interactive course, and you don’t want to build an information dump, do the next best thing—transform your content from information dump into a meaningful case study. Cases studies are still mostly linear (although you can make them interactive) but the content is framed in a way that provides context and meaning. Because of this, they get past the information dumping that plagues many courses. Find the relevant perspective. Courses don’t exist in a vacuum. Most compliance courses have some connection to the person’s day-to-day function. Find out what that is and then frame the content around that connection. A good place to learn more is by interviewing those who take the courses. Ask them when the information is important. Keep it simple. Don’t provide details that aren’t required. Not only does that take extra thinking to create but it could cause you to go on confusing tangents. Also, we’re not always the best story tellers so the simpler the better. Flip the perspective. Tell the story from the perspective of the customer or someone other than the learner. Instead of telling the learner what they need to know. Show them how not knowing affects others. If you’re stuck in a place where all you get to build is linear courses, on the next one try a case study. Pull your content into a story that is engaging and relevant to the end user. A case study is still mostly linear, but I see it as a first step in an iterative process. It helps you move away from linear, click-and-read content to engaging and memorable content. The interactivity can happen later when you get more time, oversight, and technical skill. But in the mean time you are learning to reframe the information dump. 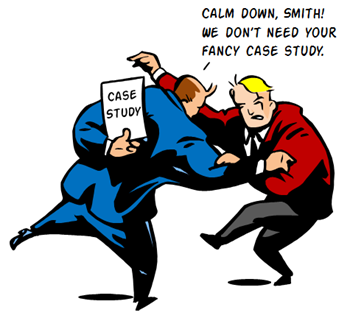 Have you used a case study approach to your courses? What’s worked for you? Win a free book. Last chance to win a copy of the new Articulate Studio ‘13 book. Winners drawn on April 30. May 4-7: Washington DC. I’ll be at ASTD International Conference & Expo. Swing by the Articulate booth #419 to say hello. May 20 & 21: Fargo, ND (ASTD). Sign up for one or both days here. June 11 & 12: Lincoln (ASTD). Sign up for one or both days here. Day 2: Getting Started with Articulate Studio ‘13. October: Dallas (ASTD). Details coming. The post Want an Engaging E-Learning Course? Start with a Case Study. appeared first on The Rapid eLearning Blog. Sabine Seufert, Professorin für Wirtschaftspädagogik an der Universität St. Gallen, denkt laut nach: Was taugt eigentlich der Begriff “Bildungsinnovation”? Was verstehen wir darunter? Wann wird der Begriff verwendet? Hilft uns vielleicht die Innovationsforschung (die es ja auch jenseits der Fraunhofer geben soll …) weiter? Wenn ich überlege, wie schnell und oft gedankenlos man von “Innovationen” oder “Trends” spricht, ist das sicher ein Thema, dem etwas “Grundlagenarbeit” gut tut. “a) Inhaltliche Dimension: Was ist der Gegenstand von Innovation? b) Normative Dimension: Ist das Neue erstrebenswert? c) Subjektive Dimension: Neu für wen? Aber sie verspricht, das Thema in naher Zukunft weiter auszubreiten. Ich bin gespannt.